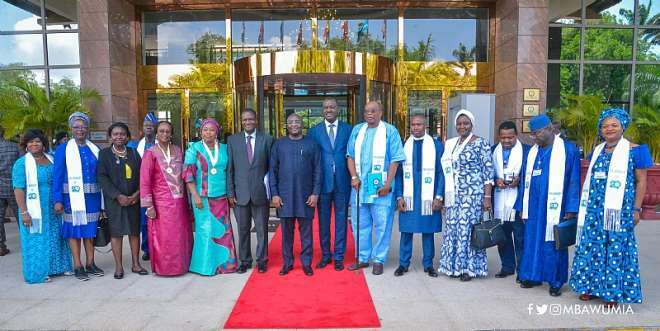 The Vice President of the Republic, Dr. Mahamudu Bawumia, has lauded the very important role Civil Society Organisations (CSOs) have played and continue to play in the growth and sustenance of democracy in the world, especially in Africa. According to the Vice President, the complementary role played by CSOs over the years, especially in election monitoring and reporting by WANEP, is a key factor in the accelerated growth of democracy in Africa, particularly in the West Africa subregion, and the governments and citizens of the region must work hand in hand with them to ensure sustained peace. “CSOs’ support for election management bodies and engagement with key stakeholders to ensure peaceful, credible elections is critical to successful democratic transitions. WANEP has demonstrated its capacity in this area through its Election Monitoring, Analysis and Mitigation (E-MAM) programme, which seeks to monitor and prevent electoral violence… My country, party and I are direct beneficiaries of the project which was implemented in partnership with the National Peace Council,” he stated. 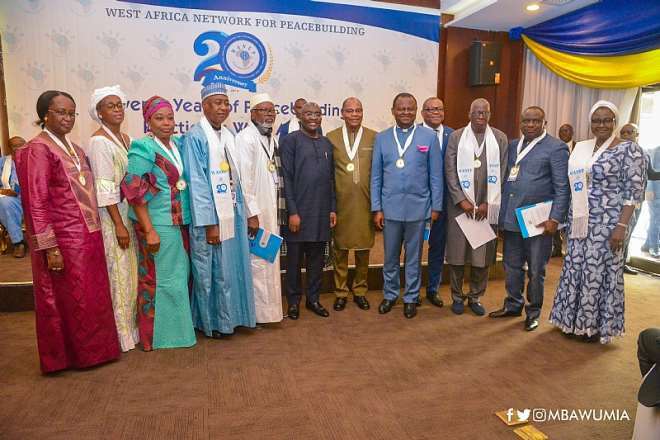 Vice President Bawumia acknowledged the important role played by CSOs when he gave the keynote address at the 20th Anniversary celebrations of the West African Network for Peacebuilding (WANEP) in Accra on Tuesday 26th March, 2019. 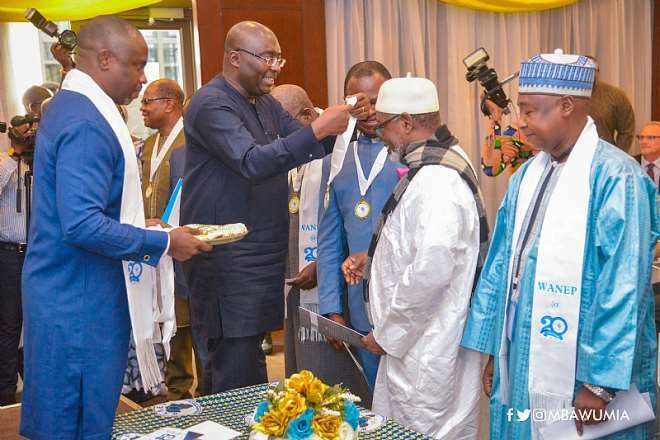 The celebration is under the theme “Twenty Years of Peacebuilding Practice in West Africa,” and brought together officials of WANEP from across Africa, as well as organisations dedicated to the promotion of peace and security. “While the primary responsibility of strengthening and consolidating democracy, peace and security resides with national governments, CSOs have demonstrated their capacity to complement government’s efforts and political leadership across the world has come to realize the utility of Civil Societies in this regard,” Vice President Bawumia indicated. “West African CSOs have undoubtedly played crucial roles in the promotion of the ECOWAS Peace and Security Agenda at regional and national levels. There is an increasing recognition that CSOs often have unfettered access to conflict zones and are in direct contact with victims, allowing them to provide unique types of information needed in conflict management and transformation. The Vice President urged governments and businesses to support the activities of CSOs, pointing out that a peaceful environment is a prerequisite for businesses to thrive. “The business community should consider sustained investments in peace and security through professional CSOs. This type of investment transcends the usual corporate social responsibility and in fact, should form part of the annual budget of business organisations. “The missing link in ongoing efforts to consolidate peace and development in Africa is certainly the absence of formal involvement of business operators and investors in the peace process and this undermines the independence of many CSOs in Africa,” he noted. Also speaking at the event, Dr Mohamed Ibn Chambas, the United Nations Special Representative of the Secretary-General for West Africa and the Sahel, and head of the United Nations Office for West Africa and the Sahel (UNOWAS), celebrated the WANEP’s “invaluable contribution” to peace building across the West African subregion and beyond, saying it was a reflection of the crucial role CSOs continue to play in sustaining peace. Meanwhile, 16 renowned peace building and conflict resolution experts have been unveiled as Peace Fellows of the College of Peace under the auspices of WANEP. 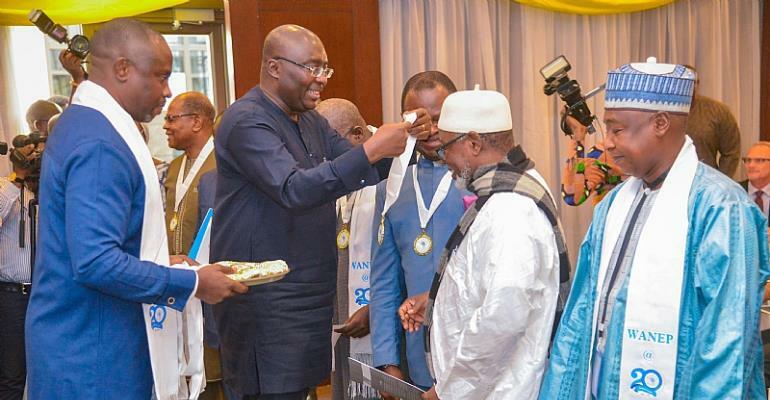 The Fellows were sworn into office by Vice President Bawumia.